Abby the Librarian: Elephant and Piggie Party! We all love El ephant and Piggie at my library and we've taken them on many an outreach visit with a lot of success. What better way to celebrate than to throw an Elephant and Piggie Party?! We made this a drop-in program for kids in grades K-2, but due to an extremely rainy afternoon we only have a handful of kids in that age range show up. We opened up the program to all ages and asked that preschoolers come with a parent and that went fine. My coworker N and I started the program by reading some of our favorite Elephant and Piggie books. 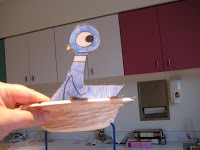 My favorites for reading aloud are I Will Surprise My Friend, I am Invited to a Party, and There is a Bird on Your Head! We read I am Invited to a Party together (she was Piggie, I was Elephant). I had wanted to try acting it out with costume props, but the planning gods were not with us on that one. Maybe next time. Since our program was only 30 minutes long, we just did one craft after reading: bird nest hats to go along with There is a Bird on Your Head! Before the program, I poked holes near the bottom of the bowls and threaded yarn through so it could be tied to keep the hat on their heads. I also put masking tape over the holes to hold the yarn in place and to make sure no glue leaked through the holes and into their hair if they put the hats on right away. You can prep as much or as little as you want. Since we had such a limited amount of time, I shredded a brown paper bag beforehand, but you could have the kids do this if you had more time. 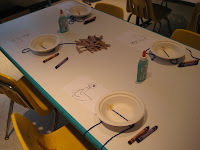 Have the kids color the sides of the bowl brown and glue on pieces of the paper bag. Depending on how much time you have, you can glue paper to just the rim of the bowl or you can glue it on the inside as well. When the kids are wearing the hats they won't be able to see inside, so you might want to concentrate on how it looks from the side (up to you!). I used a picture of Pigeon from The Pigeon Wants a Puppy. I photocopied the cover and then cut out the pigeon (I didn't include the legs since he'll be sitting in the nest). I had the kids color their pigeon, cut him ou t, and glue/tape him to the side of the bowl so that he's looking out of their nest. After kids were done with the craft, they were invited to try to find the cardboard cut-out of the Pigeon that we had hidden somewhere in our department. If they found the pigeon, they could come to the reference desk and collect a sticker (we ordered these Pigeon reading stickers from ALA for a previous event). 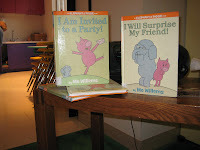 There are lots of activities available in this Elephant and Piggie Party Kit (link opens a PDF). Print out word searches and coloring sheets for the kids to take home or for them to work on while they're waiting for the party to start. The newest Elephant and Piggie book comes out June 9 (Elephants Cannot Dance) and it looks like there's another one slated for October (Pigs Make Me Sneeze), so there are plenty of upcoming occasions to celebrate Elephant and Piggie. Yeah, like we need a reason! What a super-fun idea! The kids love Elephant and Piggie, with giggles all around whenever we read it. I love the idea of doing a party with this theme. Congrats on the creativity! What a great idea! My Elephant and Piggie lover would go crazy for that! I love the bird-nest-on-head craft! Love the nest on the head idea. Must make sure Mo sees this. You're awesome! I'm having an Elephant and Piggie party at my library today, and the nests are just the craft I was looking for! Thank you!